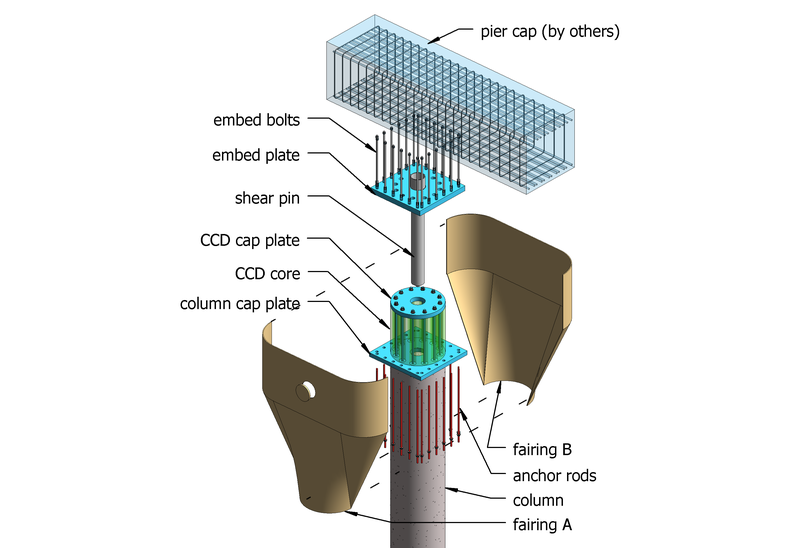 The SDD design is rooted in the search for better ductility devices for bridge construction. The SCS SDD is a result of thinking about how to incorporate modular construction, inspection and maintenance in the SDD concept. If, however, the ductility of an SDD is not required, the remainder of the system can be adapted to provide the modular construction, ease of inspection and maintenance benefits for bridge construction. This non-seismic version is called the Column Connection Device (CCD). The geometry remains similar for the CCD system except the SMA rods are replaced with conventional steel and the ECC can be replaced with high-strength, non-shrink grout. In this circumstance, the connection strength should match or slightly exceed the strength of the column. The chart below shows the non- seismic P-M curve for a the same geometry as the SDD shown in Figure 8 but replacing the SMA rods with #7 rebar and replacing the ECC core with high-strength grout to match the column strength ( f’c = 5 ksi). Note that the connection capacity is almost exactly matched to the column capacity. If the rebar is replaced with higher-strength rods (such as ASTM A449 or ASTM F1554-Grade 105) then the connection would be stronger than the column. Note that the connection shown in Figure 12 would exhibit the same load performance and overload characteristics as the column.